For years you’ve been told that eating fat makes you fat and that a calorie is a calorie is a calorie. Anyone who understands the science of Low Carb dieting knows this is just not true. In testing, the Fat Fast – 5 Days, 1000 calories per day, 90% from pure fat – resulted in average fat loss – not just weight loss, but fat loss – of over a pound per day! It’s a radical, short-term strategy, but boy, does it work – and it’s based on clinical research. 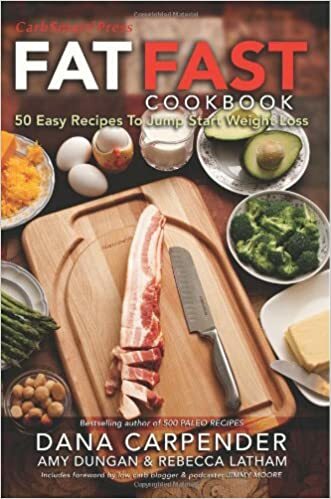 The Fat Fast Cookbook includes 50 fabulous low carb, high fat recipes that can help you break your weight loss stall or help your body become keto-adapted, catapulting you into Nutritional Ketosis. It does this with 50 great recipes to help you implement the Fat Fast. What Is Nutritional Ketosis and Why is It Important written by Jimmy Moore: Jimmy Moore, the Low Carb Community’s #1 Blogger, Podcaster and Low Carb Diet expert describes Nutritional Ketosis, how it works and how it helped him jump-start his low carb weight loss and help him lose over 60 pounds!